Well things have become a little quiet lately. Last month I finished a bigger batch of vehicles for my WW II project and right on the heels it was painting extra minis for the SAGA French Melee. I had been wondering what to play. Out of my Age of Vikings era armies none were really playable under SAGA 2, so I first has to make the choice which army to expand. Only the Vikings and Anglo-Saxons could be done in due time and I was in no mood to play Vikings, so Anglo-Saxons it was. I decided to play with a mounted Warlord, two points of mounted Hearthguards amalgamated into one unit and 4 points of Levies (3 of them with close combat weapons and 1 with bows). What gave me some headaches though, was that I had hardly gotten any games of SAGA 2 in since its release… one in mid-August another earlier this month. So I was not expecting much, except for a good weekend. The first game pitted me against Andy Lyons’ Welsh. I have to say, this was the game I had been both hoping for and dreading for years. For those who do not know him, Andy has played SAGA Grand Melees and Iron Mans all over the world and won a good number of them. A former U.K. and German champion and the current French champion, he was quite an opponent for the first match. That being said, I have known him for a man with great spirits for years, so no matter what, I was expecting a great game. Andy was playing Welsh in an all mounted, all Javelin set-up. There was a Warlord, a Priest, 2 points of Hearthguards and 3 points of Warriors. Unfortunately I cannot remember how he arranged them. Deployment method was A. Andy was first player and decided to take shots with his javelins at my Hearthguards. Which did not go too well. That turn and the next one too Andy rolled below average on his to-hit rolls, I rolled above average on my saves. This resulted in Andy having to keep his troops closer to mine than he would have liked. By the third or fourth turn my Levies were close enough to his troops and spread out enough to always be able to attack one of his units no matter where he put them at the end of his turn. So it was a close call all the time and in the end Andy won by a point. All in all I was extremely happy with the result, which put me in the midfield and still gave me chances for a good result in the end. But in all fairness, had the dice been more average, Andy would have won by a bigger margin. First things first. 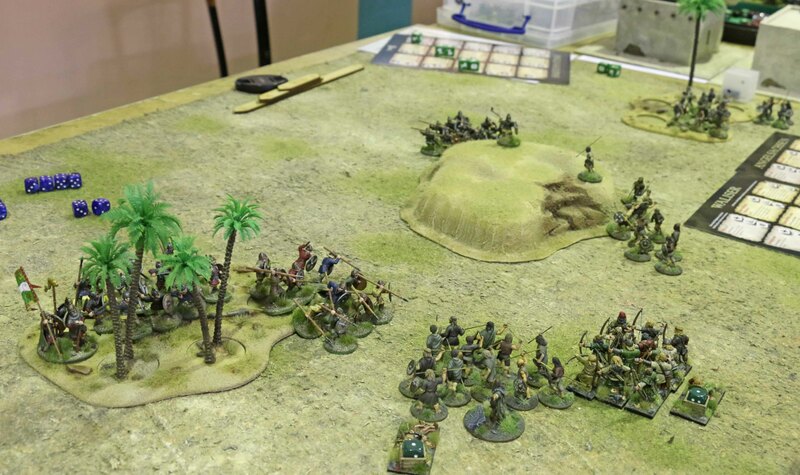 This scenario was based on the Clash of Warlords, but both players got to place two objectives each (at least L from a long board edge and at least M from another objective). Being in procession (having a unit within VS of an objective at the end of the game, without any enemy units within VS) gave you another two kill points per objective. This game I was playing a very good French player, who’s name I unfortunately forgot [EDIT: It was Dorian.] He was playing Normans. 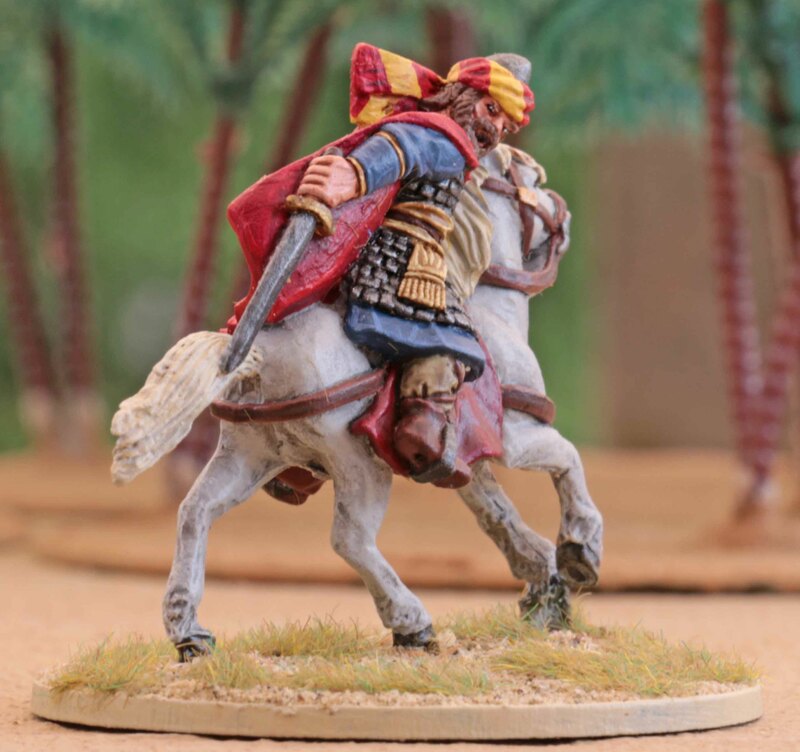 A mounted Warlord and a mounted Priest, 1 point of mounted Hearthguards, 2 points of mounted Warriors (spread into two units of 5 and one of 6 men), 1 point of Warriors on foot with close combat weapons and 1 point of Levy archers. Deployment method was B and we both put the objectives in terrain in our home corner close to our respective Levie archers. I began in a strong round defense hidden from his Archers by a large hill in the middle, expecting such a mobile army to go on the offensive. Again I was player two and took a heavy beating for it. My opponent rolled well on his three SAGA dice and together with the use of We Obey managed to send his larger unit of mounted Warriors charging into my Hearthguards using two SAGA abilities (Charge and Pursuit) to beef their mettle quite a bit in additions to the benefits from charging with javelins. This cost me dearly, since I lost a total of 7 Hearthguards. My other troops were able to mop those Warriors of his up once it was my turn, but it meant we had traded 6 Warriors of his versus 7 Hearthguards (and I think a Levy or two) of mine. Which left me down four slaughterpoints on aggregate. Not a good start, since I had to go on the attack now to make up for that. So I left the bow armed Levies alone to guard the objectives, while the rest of my army began their journey to attack the enemy positions. All game long the dice were a reversal of the previous game. This time I rolled sub-par and my opponent better than average. But still my troops kept constantly closing the gap. Things still did not look too good until the fifth turn when he tried to take out my Warlord and failed, loosing a unit of Warriors. My counterattacks cost him his Warlord and now I was in the lead. My plan sometime during the game had become to contest his objectives with my Warlord (the only unit mobile enough) on the final turn, but all this fighting had left him with too much fatigue, so I just scrapped that plan. On the other hand my opponent did not manage to contest mine either since he was kept too busy on his flank. So in the end my lead in slaughter point gave me the victory. Game three would bring another Clash of Warlords variant. This time one would only score slaughter point in Melee and each time your Warlord took part in a Melee it would be another two bonus slaughter points. There would be no slaughter point for a unit being destroyed completely. After having had to play two armies that were either completely or mostly mounted I had been hoping for an all foot opponent. My wish was granted, but one should always beware what you wish for. Emmanuel (who came second overall [EDIT: He came third overall]) was playing Pagan Rus and this was not the kind of game I had hoped for. 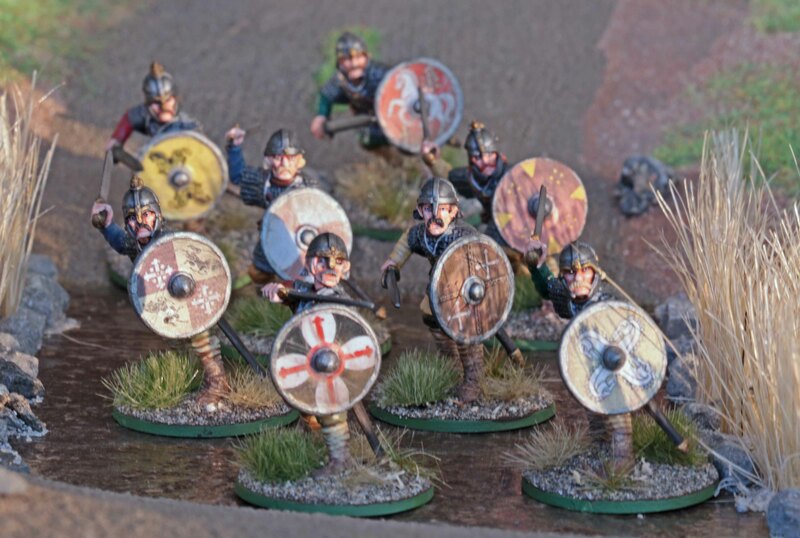 He fielded a Warlord, 3 points of Hearthguards (amalgamated into two units of six), 2 points of Warriors (fielded as a unit of twelve and four mean respectively) and a unit of Gall-Gaedhil mercenaries. Set-up was according to method B once more. Due to the Pagan Rus ability Frozen Winds my units were fairly spread out (but they still suffered from it for the first three turns), while my opponent deployed fairly compact. I can no longer remember who was player one, but it did not really matter. Emmanuel made heavy use of Blizzard, Long Winter and Biting Cold all throughout the game, which over the first three turns meant that except for a volley by my archers against his large unit of Warriors I did not get any charges or volleys in. So I simply positioned my units where they would be able to either attack next turn or force my opponent to withdraw. And I made sure I always had Valiant Hearts actived and had a mix of Defenders of the Kingdom, Closed Ranks and Clash of Shields on my board. Which paid off. 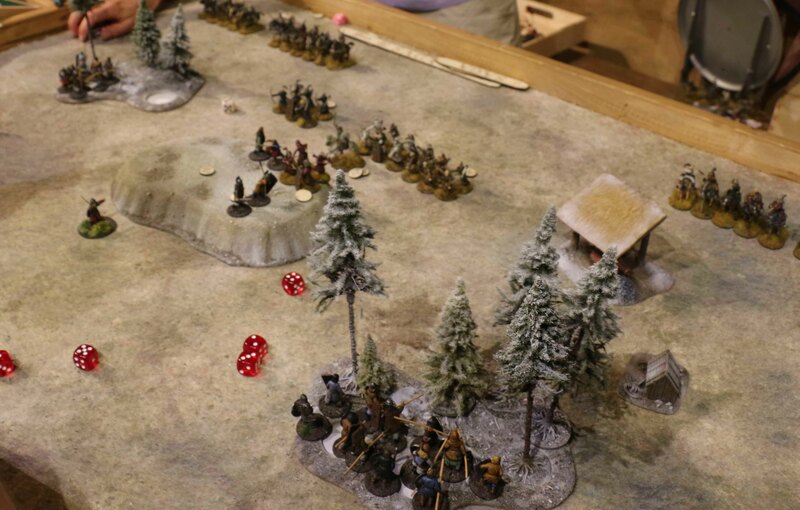 His large unit of Warriors attacked my Levies with bows in rocky ground and took a heavy beating. Virtually the same happened when his Gall-Gaedhil followed up. They were now attacked by one of my Levies to my advantage. 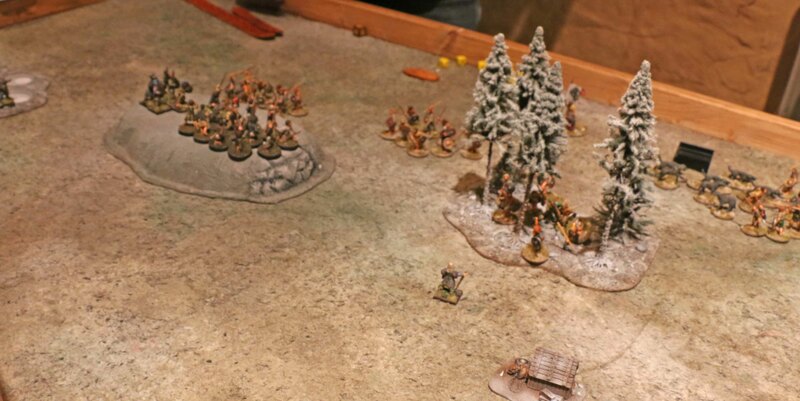 Now I was leading on slaughter points and his board became oriented towards the offensive which meant I was actually able to get two charges of my own choosing in. His attacks met a similar fate as before. But until the end of the game I was unable to attack with my Warlord. His formation was too compact to risk that and the easier targets were situated within ruins, making them too hard to attack. We had to finish the game after the fifth turn due to us taking a little too long, but the result was a solid victory for me. The second day began with yet another Clash of Warlords variant. Every turn from the second turn onwards, one would get an extra slaughter point for every unit that was completely within the opponents half of the table. I was facing Simon who was playing Normans as well. 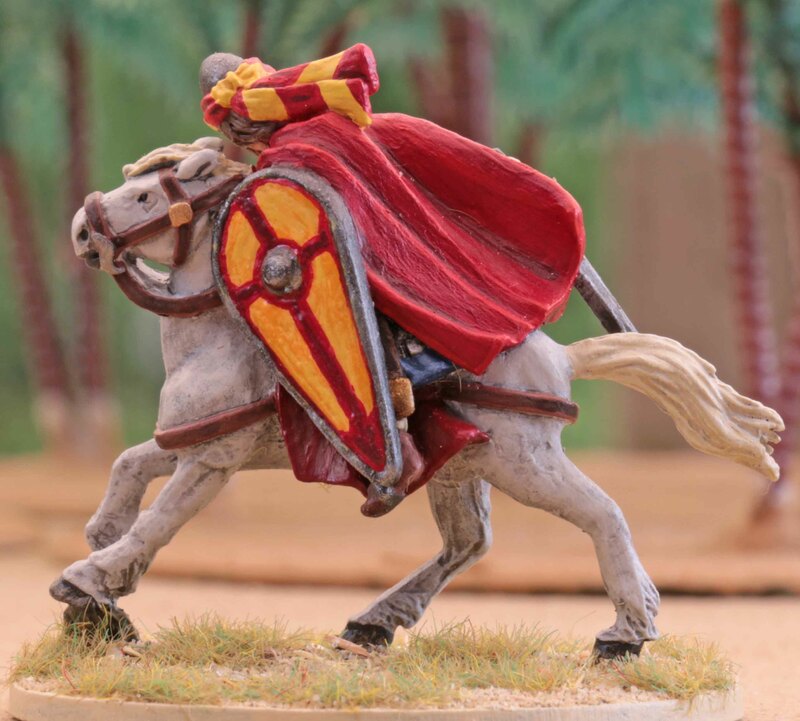 His force consisted of a mounted Warlord and Priest, a point of Hearthguards three points of mounted Warriors (spread out in a number units of six, five and four men) and a point of archers. I was aware that to win this one, had to prevent my opponent from getting on my side of the table as long as possible, since I would hardly be able to contain, let alone catch, this many mounted units once they got to my side. So I tried to make the centre of the table as restrictive as possible by placing a large wood on the right flank, a swamp on the left and a field in the centre. I was player one and rolled a four as our deployment method (method B), but chose to shift that to method C. Due to his large number of units and the large cavalry bases he was using he had to spread his units out a lot, placing some of them either behind terrain the had to move around or at the very edge of the table. All in all this meant that during turn two and three I had more units on his side of the table than he had on mine. Special praise has to go to my Hearthguards who held on to my left flank on their own versus three units of Warriors and later on the Warlord and Priest. I had to laugh when Simon put a lot of effort into attacking them with a unit of Warriors aided by the Charge and Pursuit abilities only to find I still had Valiant Hearts active and had Defenders of the Kingdom and Clash of Shields on my board. All in all this fight cost me nothing while he lost his whole unit. But I also made a stupid mistake when I became greedy and had my last remaining Hearthguard attack his exposed Priest later on only to die in the process without doing the Priest any harm. Only in turn four and five did the number of units on the opponents side shift substantially in his favour. But during the whole game I had done my best to both keep him back and bring his Warrior units below the four men threshold for creating SAGA dice. Which meant I was in the lead on real slaughter points. In the end he had slightly more points for units on the opponents side than I had while I got more from the kills. Again the game had to be called after turn five and we were equal on points. The tournament did not allow for a draw and since I still had vastly more men left on the table, I it was a minor victory for me. This variant would give each player two extra slaughter points at the end of each of their own turns per unit for every unit partially within M of the table-centre. This time my opponent was Jan who also played Anglo-Saxons. 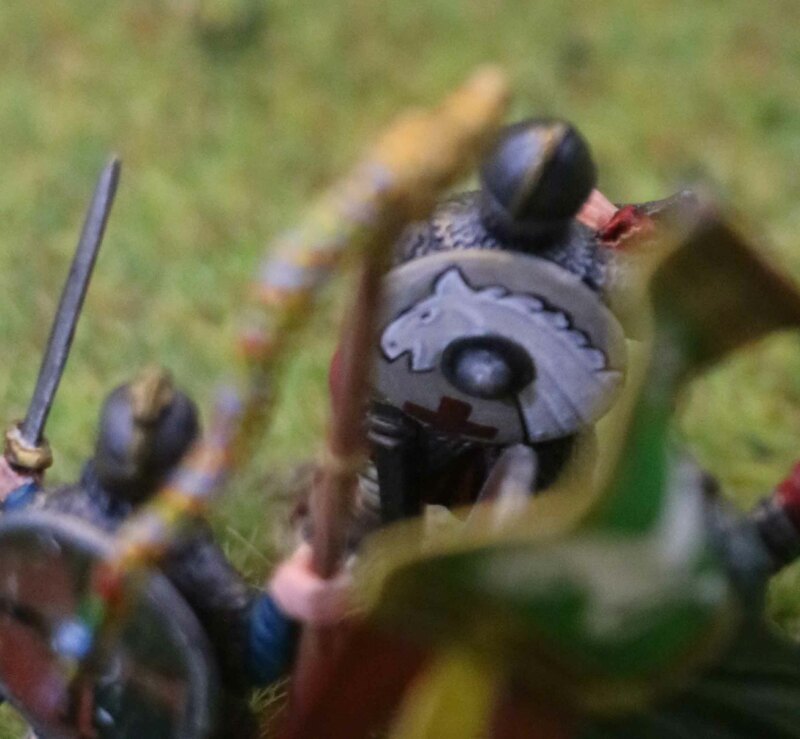 He fielded a Warlord on foot, a Priest on foot, a unit of Gall-Gaedhil mercenaries, 3 points of Levies with close combat weapons and 1 point of Levies with bows. I was expecting this to become a very bogged down game given the defensive orientation of the Anglo-Saxons. Again, I was player one. 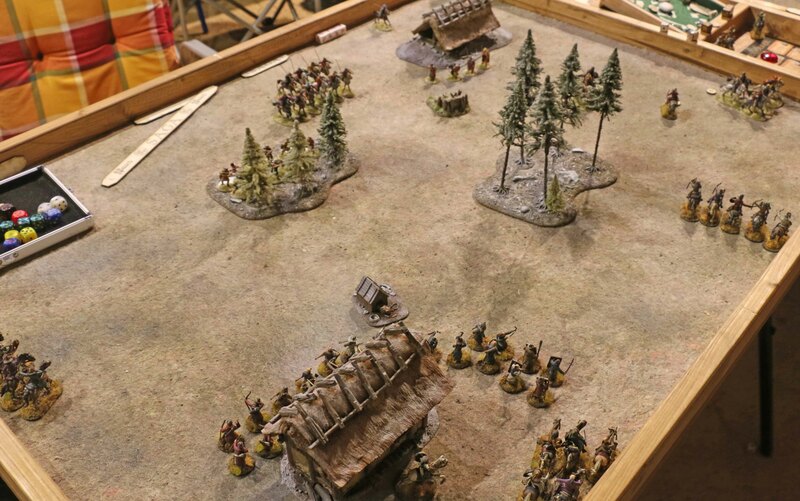 I have to say, I did not care much for terrain, except that I wanted a field on my side of the table partially within M of the centre where I could place my archers and that the rest of the terrain I deployed (a hill) did not restrict the movement of my cavalry too much. Jan placed two small woods on his side of the table, also partially within M of the centre, one of which I moved away from the centre. Deployment was according to method C again. I did not roll too well on those three initial SAGA dice. So there was no way I could do him some harm and I settled for two defensive abilities to get me through the first turn and moved two units of Levies and my Warlord within M of the centre. My opponent tried to expel as many of them as possible (and succeeded on the two close combat Levy units) and tried to kill my Warlord (which he did not, but which left my Warlord with three fatigue). The next turn my Hearthguards together with two units of close combat Levies managed to push the enemy back, giving them a heavy beating. My Warlord was still very exposed, had two fatigue and had three units of Levies within S of him. Which made him a tempting target (both as a kill and due to the fatigue the other units within S would get upon his death). So Jan tried to brush one unit of Levies away with his Levies and Gall-Gaedhil (which he managed) and kill my Warlord with the later (which he did not). But this had left his Mercenaries with three fatigue and they were wiped out by my Hearthguards without any losses of my own the next turn (I used two of his fatigue to raise my armour to seven). 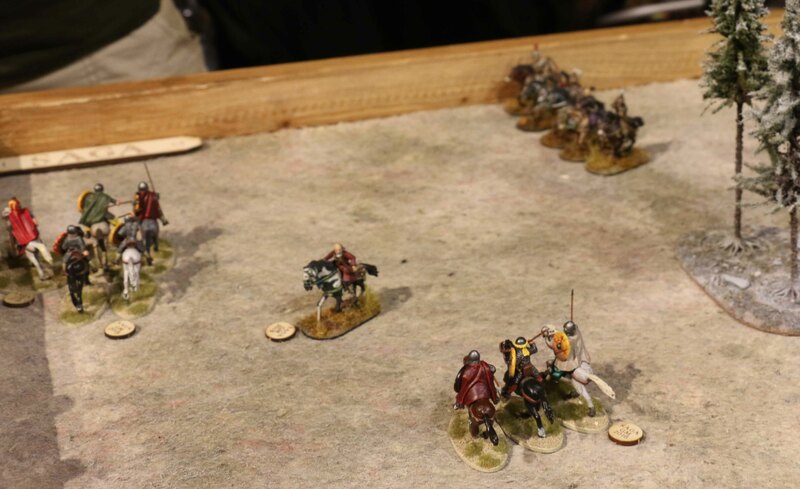 My Levies regained their position against their oposites and the dollowing turn my Hearthguards about faced and pushed another unit of Levies out. From then on it was only securing my position (gaining ten slaughter points per turn) and harressing the enemy. In the end I won by a margin for 39 points, for a superior victory. What really made me happy was that in this very last game, my Hearthguards were able to enact their envisioned role of shocktroops for the first time. All in all I ended up with 62 tournament points and made fifth place overall. With which I am mighty happy, given both my lack of preparation and the quality of the opponents. The later was really amazing. I have played in a number of tournaments over the years and always have I had one opponent that only gave me an easier game. Not so this time. They were all very good players and there was not a single game that one could just play it home easily. Even the very last game was much harder than the result would suggest. The general sportsmanship, not just in the games I played but also what I saw on adjacent tables, was very good. Being provided with lunch on both days and dinner on the first day as well as cake was a huge bonus. So all in all, it was a very taxing, but friendly and enjoyable weekend. One I will certainly try my best to repeat as often as possible in coming years. So it is supposedly summer here in Europe, so I wanted to take photos of my Spanish for SAGA outside. Well two weeks of almost constant rain and thunderstorms later I finally found one sunny day and was able to do so. First of all a few general comments on these minis. Some time after the 2015 German Grand Melee I had decided I wanted Crescent & Cross army for SAGa as well. The one that intrigued me the most were the Spanish. Their style of play seemed vastly different from what I already had and they seemed to be rare as hens teeth (I usually y do not like playing what everyone else plays). So they were ordered and that is where things got a bit of track. 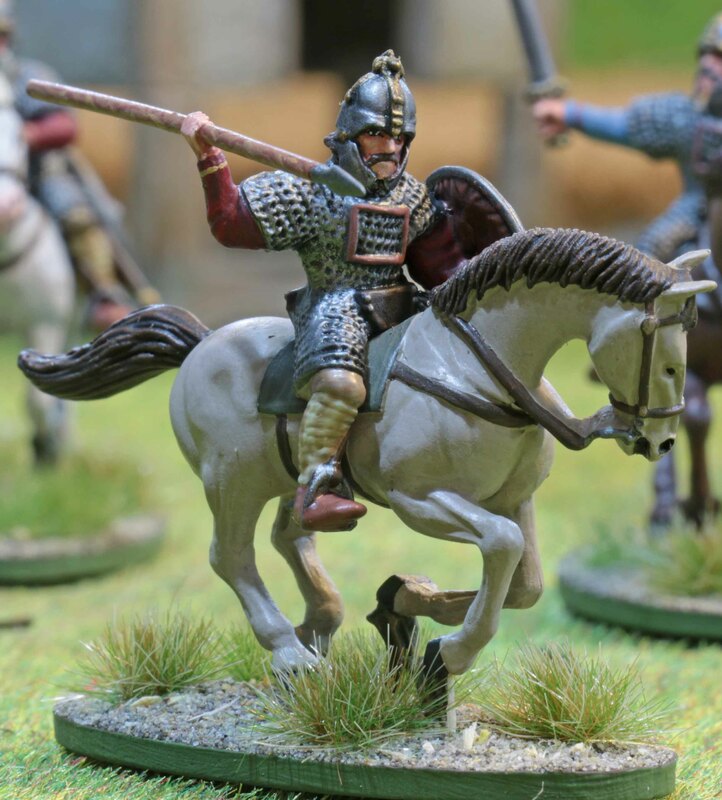 Back in fall Gripping Beast was unable to deliver the Warriors both mounted and on foot to my German dealer of choice. So all I got was one point of Levies, three points of Hearthguards and the Warlord. Not wanting to paint an incomplete army, I let them rest on the lead mountain for a while. 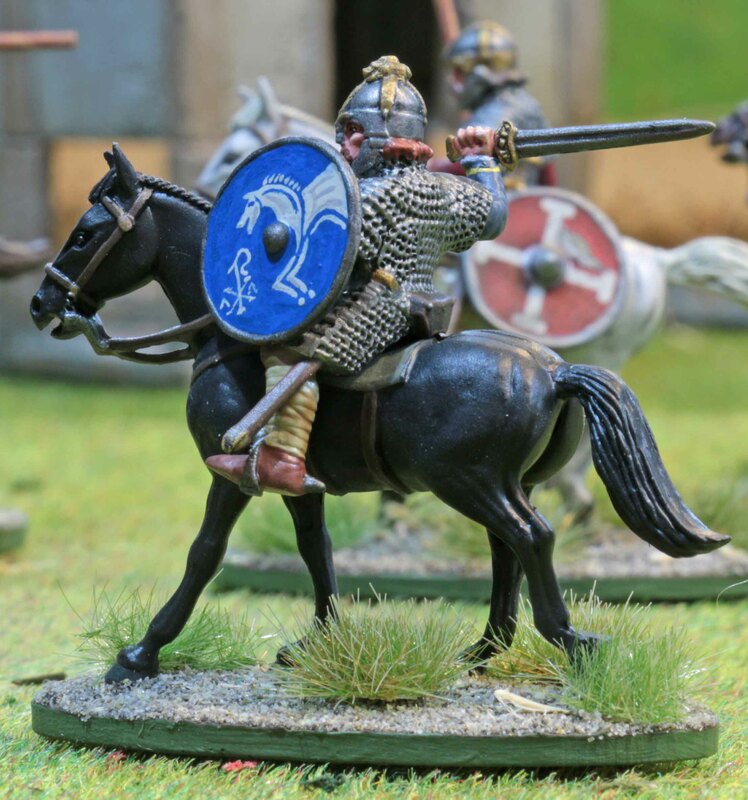 Then during the winter, I decided to start with my Anglo Saxons, which got finished just in time for the tournament at Klingencon as you know. That left me only about eight weeks to get the Spanish done in time for this years Grand Melee and I still did not have any Warriors. And what I had was not cleaned or primed or anything. At least my dealer got back to me with the good news that he had secured those Warriors for me. Unfortunately his packaging service messed that order up and what I got was two Welsh and two Viking starters each.About a month before this year Grand Melee they finally arrived, too. All in all I painted 57 minis, 29 of them mounted, in about 7½ weeks and that is besides my day job. Timing was pretty tight and in the end I put the flock on the bases 2200h the day before the Grand Melee. All in all this meant about a third of the average number of minis I usually paint per year were done in two months time. 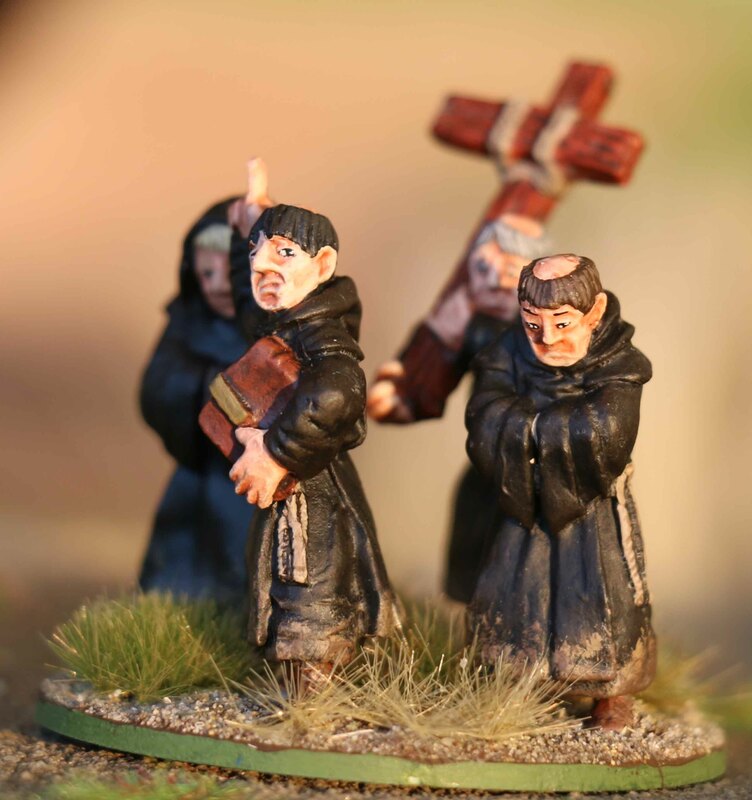 Add to that the 51 Anglo-Saxons and Monks painted right before these Spanish, I can say, that I am now content with painting any medical minis for this year! Well enough of my ramblings, let’s get to the minis. I will show them in the order in which they were painted. All minis are by Gripping Beast. I have to say the minis were a bit of a mixed bag over all. 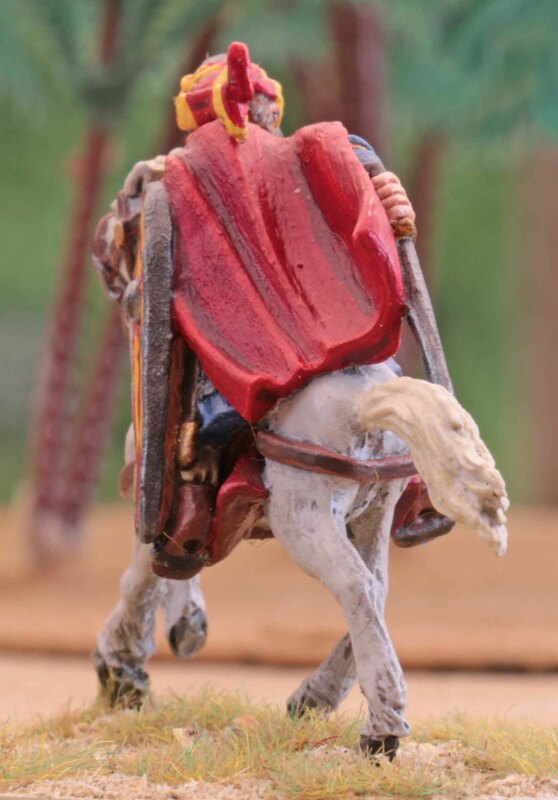 The casting on the horses was abysmal. At times it felt more like carving new horses out of a block of lead than cleaning away flash. Otherwise the castings were OK. Animation was good, but the faces were a bit hit and miss. The mounted Warriors had great expressions, their brothers on foot were quite poor. The rest was in between. Up first I painted the Levies with Crossbows. The minis were quite nice and far better than the Norman Crossbows. I would have wished for a little more variety (there are “only” four different poses in the pack), but even that did not stand out too much, as those four poses are quite different. I went a little more adventurous here and gave two of them black skin. Not sure why. I guess I imagined them as Moorish prisoners of war who had switched sides or had been press ganged into fighting for the Iberians. Up next came the Hearthguards. What I really liked about these was the variety I got, for all twelve riders are different (maybe that is what I was a little disappointed with the Levies). For their spears I tried something new. They are no brass like the ones I usually use, but bristles from a nylon broom, cut to length with flattened and shaped tips. And I am quite happy with that experiment. They are flexible so the do not break off as easy, do not hurt if you touch them, are much cheaper (I got a set of roughly 400 at Aldi for 3,50 Euro ;-)) and the paint sticks well. Although when it comes to the paint sticking… I used a broom that had been in use a couple of years (which was actually replaced with the Aldi one), so the bristles were sanded, which might improve paint adherence. In the end I used this type of spears for all my Spanish with spears or javelins. For the shields I used transfers from LBMS. I had hoped, that this would actually reduce the time spend on them, but I was slightly wrong there. The way the shields are sculpted, they are covered by painted hide, drawn over the rim and nailed to the back. So not quick fix like painting the rim in metal. So I had to continue the pattern over the rim and onto the back, which was a paint with those checkerboard patterns. Also the transfers have 3 slightly different shades of yellow, so that was hard to match. So with me still waiting for the Warriors, I tackled the Warlord. Not much to say about him, except that I went for finer fabrics on his clothes than I did with the others. And the yellow for the shield failed me. The paint was a little too thick which unfortunately left make on the shield face. So now my Warriors had finally arrived and the mad rush to clean and paint them begun. I went for the ones on foot first. For one I figured that these would be superior to their mounted version in the second game of the tournament. 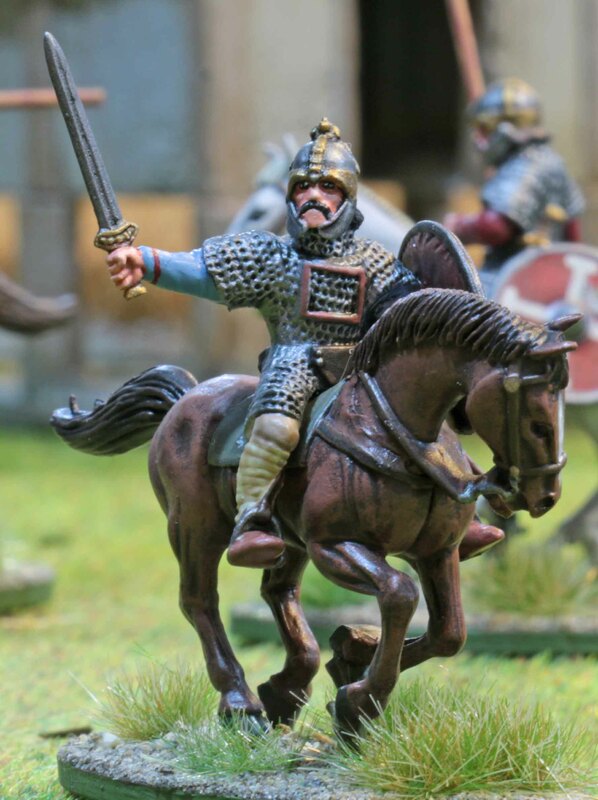 And second… well should i have run out of time completely, I could have gotten away with just painting the riders and ripping my Byzantines off their horses mounting the Iberians on the Byzantine horses. Fortunately it did not come to that. The tear shaped shields on the majority of these Warriors crossed my best laid plans for the transfers, as all the LBMS transfers are round and I had to handpaint most of them after all. And last came the mounted Warriors. Not much to say about these, as they are quite straight forward. I only removed the hassles off some of the shields, so I could use the transfers for them. And this is it… a massive 8 point army. But I will probably add another point to it in the future, since I also want some Levies with spears, in case I ever have to play a scenario in a tournament where crossbows are useless due to a range reduction. I know some might have wondered, if this blog was dead, but no it is not. 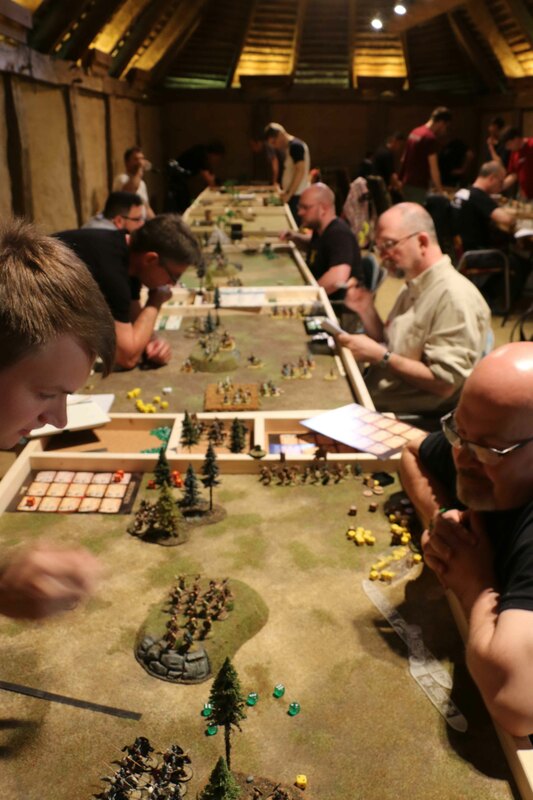 The reason for the lack of posts in recent weeks was the upcoming SAGA Grand Melee here in Germany. Or more precisely the mad idea to paint up a completely new army for it in the roughly seven weeks leading up to the event. Lets just say my Spanish got finished the night before the event, but that is something for the next post here. 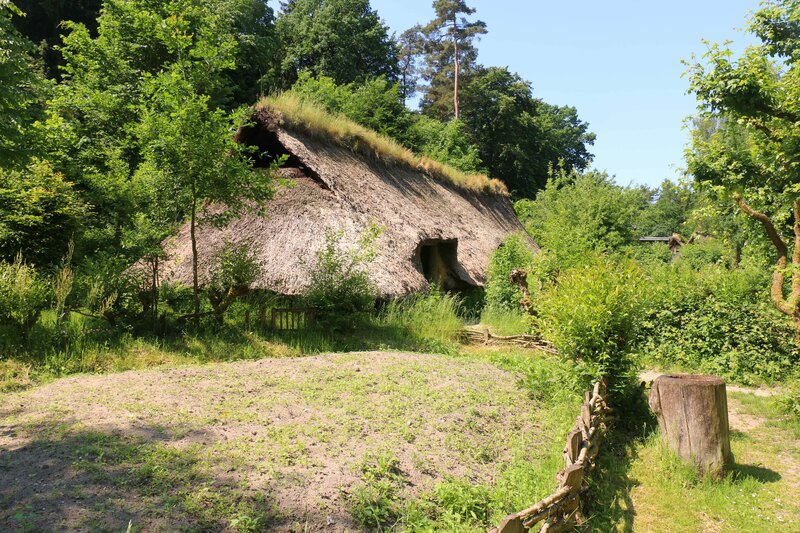 So we were back at Oerlinghausen here in Germany, playing in the Saxon Longhouse and under the gaze of the Anglo-Saxon gods. This time my friend Martin accompanied me (he had been sick last year). My plan was not to finish worse than last year (5th place) which was a tall aim, to be fair, since I was completely unused to the Spanish, having played only one game with proxy miniatures with them and that was one of the more obscure scenarios from the Grand Melee, that did not allow to learn the army too well. 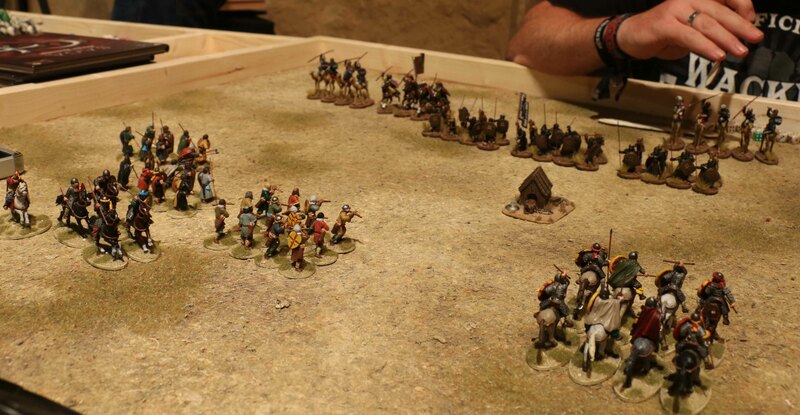 My army consisted of a mounted Warlord, three points of Heathguards (mounted), two points of Warriors (with miniatures for both the foot and mounted options) and one point of levies with crossbows. Now I knew from the beginning, that this would be a very tough game. 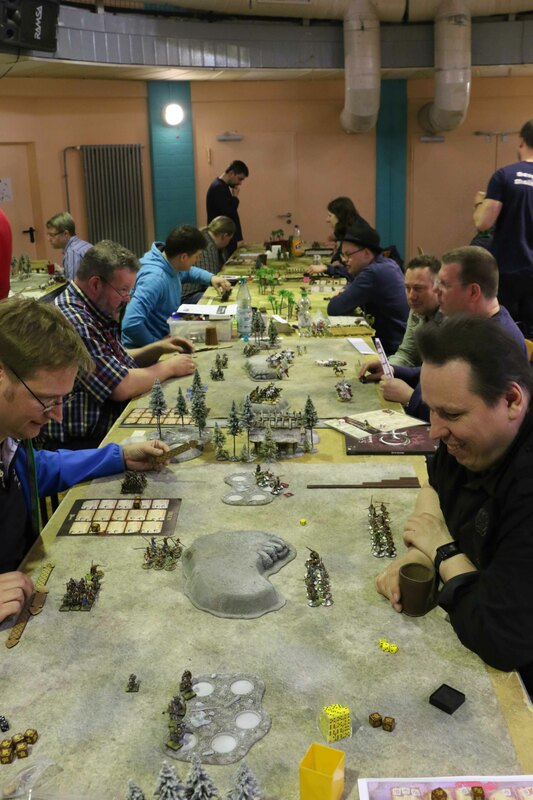 My opponent was Erik who was also my last opponent at Remscheid roughly two months earlier. Therefore I knew that he was a very experienced player, who knows the Mutatawwi´a inside out and plays them with great skills. His army consisted of a camel mounted Warlord, two points of Heathguards on camels fielded as two units of four and four points of Warriors. 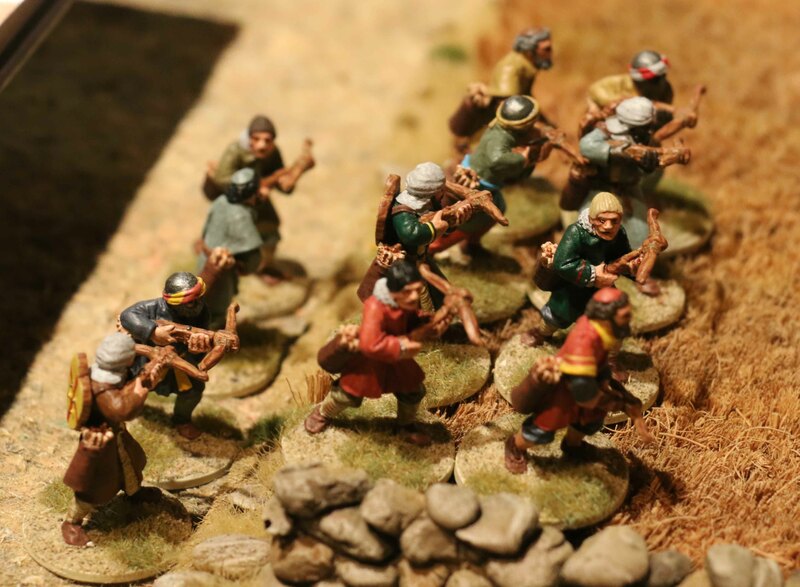 The later were fielded as two units with close combat weapons (one eight men strong, the other twelve men strong) and a twelve men strong unit of bowmen with a banner. I did not want to offer his camels too many mounted troops, so my warriors were deployed as two foot units of eight. My Hearthguards were deployed as one unit of eight and one of four. I started to play and things went down the drain from the first moment. I think I was still a bit drained from he previous weeks painting spree, for I forgot that one cannot score victory points on turn one. So my horsemen rode up the central hill without any need for them to do so. 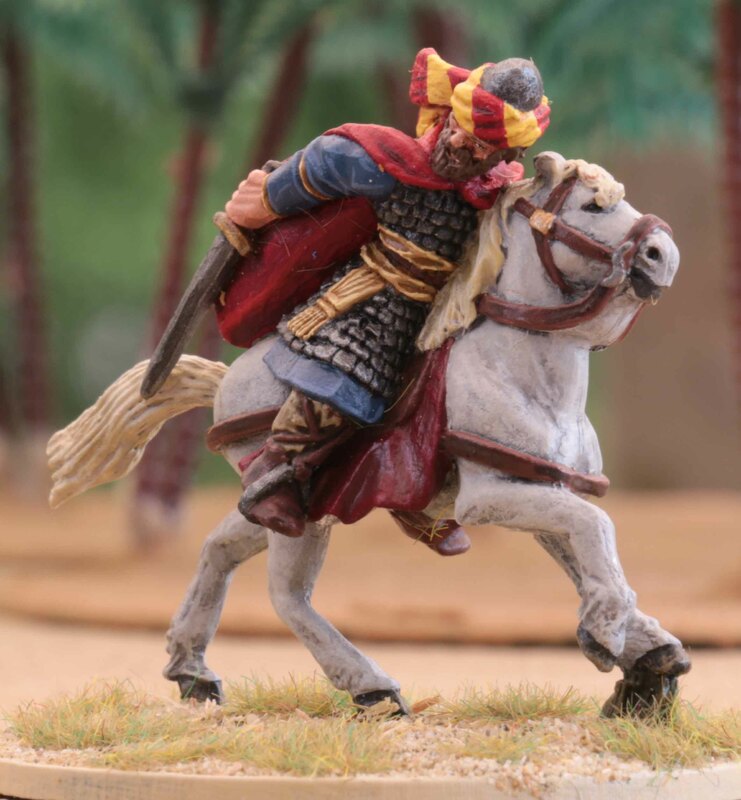 As a result one of his camel mounted units crashed into my large units of horsemen and with a combination of various Mutatawwi´a SAGA abilities both units were annihilated (with a net loss of four Heathguards for me). 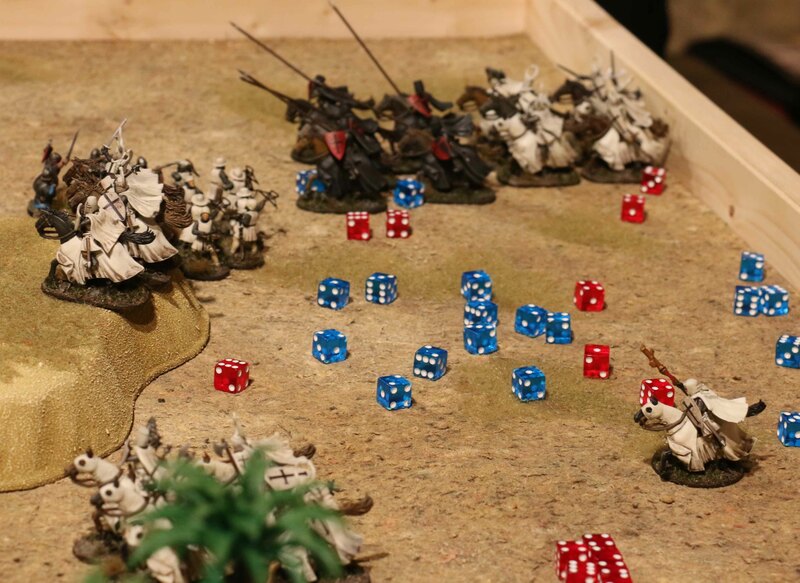 I also had to find that one of my best SAGA abilities (Reconquista) does not work against Mutatawii´a, since its effect is determined by the number of SAGa dice the opponent has on his board at the end of the orders phase, while Mutatawii´a generate extra SAGA dice after the orders phase. My counter attacks the next turn did not go well, due to bad dice rolling. But when Erik got to act, he wiped out my other unit of Hearthguards and one unit of warriors for hardly any losses of his own. Victory points at the end of this turn were 8 to 4 in Eriks favor and when the next turn saw me lose my other unit of Warriors, I decided to capitulate. At first Erik did not want to accept (he wanted more kill points for a possible tie breaker at the end of the tournament), but when we explained, that only the quality (= final standings) of the opponents would decide any tie-breakers, he agreed to cut my suffering short. This scenario was modified for the tournament. Ranged weapons would only be able to fire “S” distance. Mounted units would only be allowed to move “M”, unless they risked a taking a fatigue on a roll of “1” or “2”. This time I would play my mate Martin. 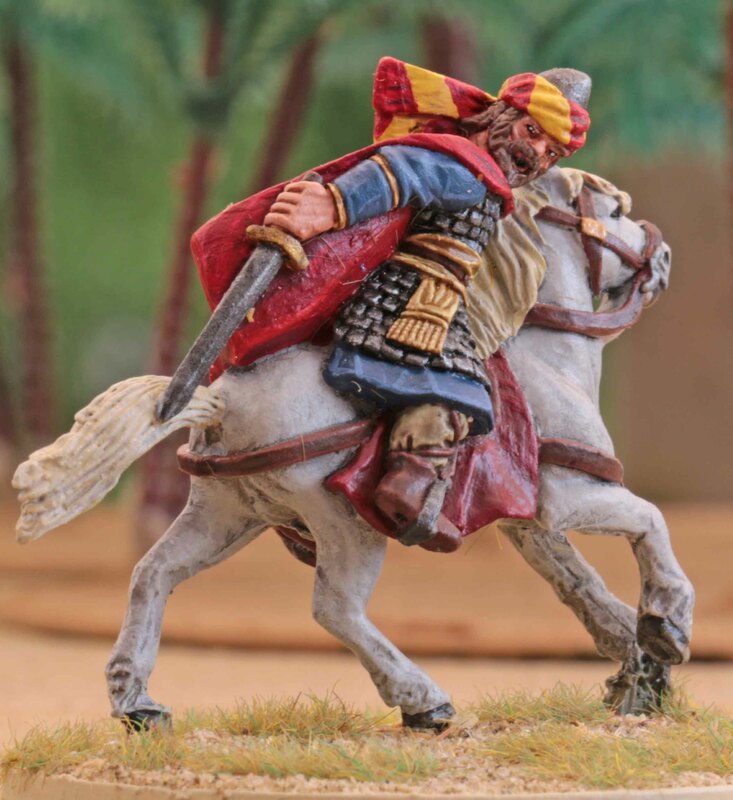 He played his troops with a camel mounted Warlord, one point of horse mounted Hearthguards, two points of camel mounted Hearthguards and three pints of Warriors with close combat weapons. They were all fielded like that. My army looked the same as it did during the previous game, except that my Levies were armed with javelins this time (I did not have appropriate minis, but Martin did not mind). To be honest, the game was a bit boring. I had already played a couple of games vs. Martin using his Mutatawii´a, so I knew by hard how he would play them. So I was able to make good use of my Iberia ability to keep my Hearthguards out of most critical situations. We both did not roll too well during the whole game, but Martin managed to roll even worse than me. After Martins last activation of the last turn I was 7 ½ points in the lead and decided not to do anything on my turn, not wanting to risk that lead and just bag the win. My opponent for this game was Jens and his Anglo-Saxons were led by a mounted Warlord plus a Priest to grant him extra SAGA dice. All his other troops were on foot and consisted of three points of Warriors (amalgamated into two units of twelve) and two points of Levies. My Levies were armed with crossbows again, but this time only four Warriors would fight on foot, with the other twelve fighting mounted. This is also the way I would play my army for the rest of the tournament. 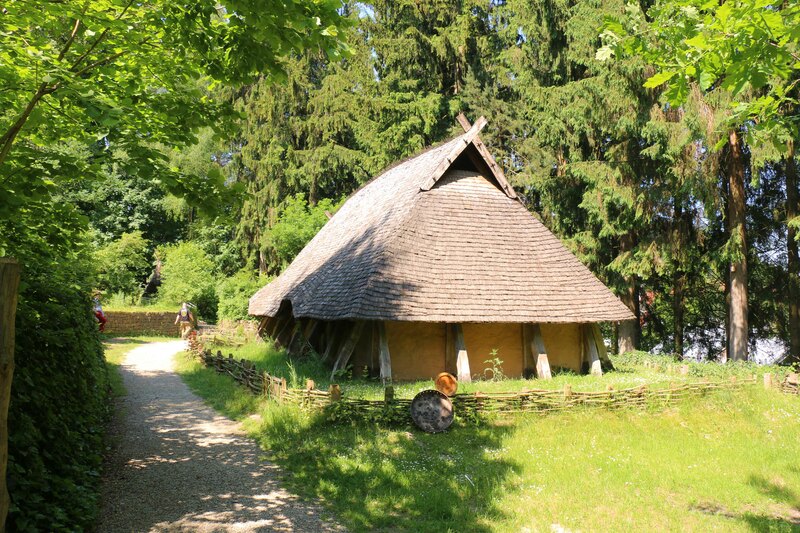 Jens put his barrel inside a wood in one of this corners protected by one unit of Levies and the priest. My barrel was left in a cornfield in the opposite corner, protect by my Warriors on foot and the Levies. All out other units were free to roam the battlefield. Having played about half a dozen games with Anglo-Saxons myself, I had a pretty good idea how to play this one and it worked out well. My Hearthguards managed to stay out of trouble and only picked those fights where they had an advantage, while my mounted Warriors kept harassing his troops. Pretty soon all his units were decimated enough not to be able to make good use of the Anglo-Saxon abilities anymore. Now the small unit of Hearthguards and Warriors would have to kill enough troops to open the way for my other Hearthguards and Warlord to administer the killing blow and take out his barrel. And they managed to open the way by the end of my pan-ultimate turn. It all went according to plan and looked like a decisive win. But Jens had sent out his Warlord and a unit of warriors to destroy my barrel. Between my mounted Warriors javelins and the crossbow bolts my troops were pretty fast to decimate this force to the Warlord and five Warriors. But then my dice rolling got worse and neither my crossbow bolts and javelins could take them out. By the end of Jens pan-ultimate turn they had been in combat with my Levies and Warriors on foot for two turns, had only lost a further two Warriors and my troops were down to three or four Levies and one Warrior. Now I rolled bad on my SAGA dice and this put my between a rock and a hard place. I had too few activations to take out his barrel for sure, but with the few troops I had left, there was no chance for me to defend mine. So even if my attack went well, the best I could hope for was a draw, but there was a good chance for a loss as well. So I decided to have my Warlord and large Hearthguard unit attack his attacking force. They managed to secure my barrel, but by doing so, I had to forfeit my chance to destroy his. So in the end, the game ended with a draw. But this was the first game that I started to feel at home playing the Spanish. Again this scenario had some modifications from the standard version. The cart would only get the extra defensive dice in close combat. The game would not end with a cart leaving the table. This would give the player two victory points instead. The opponent would get one more victory point each for killing the enemy Warlord or destroying the enemy cart. nothing else would be worth any victory points. As I said, my troops were set up the same as last game. Jan my opponent had Brian Boru for his Warlord, Ulf the Quarrelsome as a Cuiradh, four points of Warriors and one Point of Irish Bloodhounds. Jan set his cart up on the road, while I tried to sneak my along one board edge. In theory the first turn was quite uneventful, except that the Jan used his Sons of Dana ability, boosted by some other abilities to have one of the woods kill five of my mounted warriors. Most of Jans troops operated in the centre where they slowly worked their way into my troops, but not enough to open a way for his cart. At the same time most of my Hearthguards and the mounted Warriors fought with his lone twelve men unit of Warriors on the flank with my cart. I have to say most of the game was dominated by the dice. Jan kept on rolling an hilarious amount of “5”s and “6”s while most of my rolls were mostly “3”s or less, also my SAGA dice rolled no rare symbols for two turns. When they did, Jan, who plays Spanish himself, made sure I could not take any advantage. This way I lost my mounted warriors and small unit of Hearthguards pretty fast, while Jans warriors on the flank had only lost five men. On the third turn Jan had this unit throw their javelins at my cart, two hit and I saved neither. They next turn saw me loose most of my other Hearthguards and Warlord. With only the Levies, one Warrior on foot and two or three Hearthguards left, I had no chance to push my way through to either his cart or Warlord, so I capitulated. So at the end of the first day, I had one win, one draw and two losses under belt. Not the way I had wanted the day to go. At this time it also felt like a mixed bag to me. Lots of bad dice rolling and three games with opposing armies that were tough for me. The Mutatawii´a because they denied me my best abilities and made my cavalry weary of their camels. 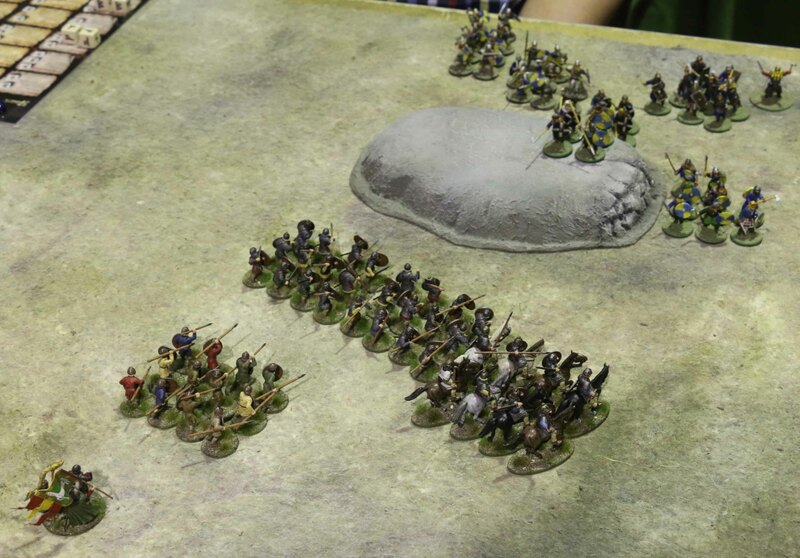 And the Irish in the last game where their large number of foot troops could make the best of the abundance of terrain which was a psychological drain due to the Sons of Dana ability, too. And the one victory, did not feel like one either, given that I was only able to net it due to the fact that I knew my friends style of play so well. So I ended the first day slightly frustrated and unable to tell, if the Spanish were a good army or not. Now it was up to the second day of the tournament to raise my mood. For this game I was matched up versus one of the three women in the competition, Kim (who also won best painted army) and her Steppe Tribes. 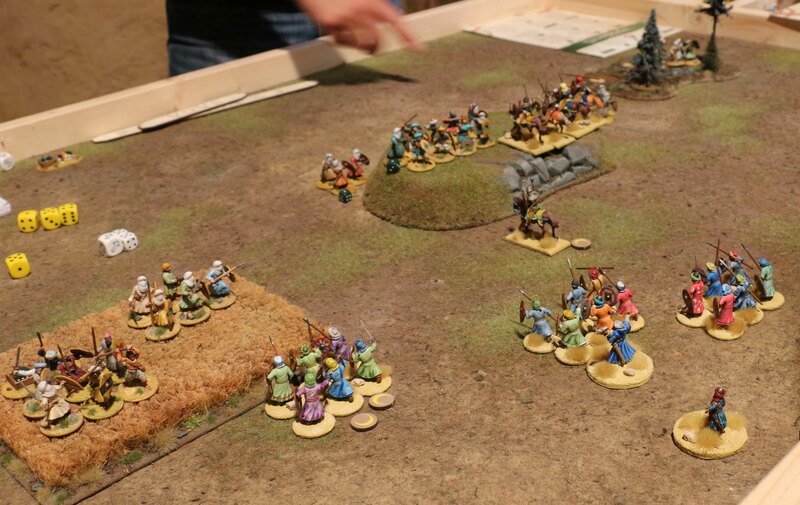 They were led by a Priest Warlord and consisted of 4 points of Warriors (split over 6 units) and 2 points of Levies with bows (split over 5 units). 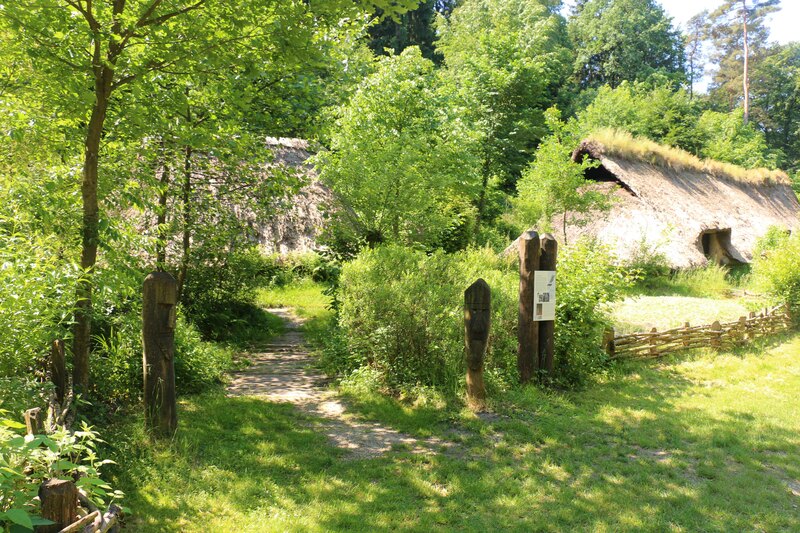 I had deployed my Warriors on foot near the building that was to be defended and the crossbows in a woods near the centre of the table. All my mounted units were to roam freely on the board. Kim had set up her Levies around the building with all her Warriors (except one unit that always stayed near the Warlord) also in position to roam around. So this one looked like a stalemate from the beginning. With the ability of the Steppe Tribes to shoot all Levies at once, if only they were close enough to the Warlord (which they were), I stood very limited chance to survive an assault on Kims building. On the other hand her Warriors lacked the staying power to push through my Hearthguards. And this is how it played out. All of Kims efforts to push forward were punished by my mounted troops or the crossbows, usually ending in the annihilation of her units. So for the whole game, I was able to contain her troops in her quarter of the table. But she always kept her Levies and Warriors back, so that I did not dare to attack her building. Now I have to admit, that I never played with or against Steppe Tribes and only ever read them online once a couple of years ago. So I asked for a battle board and read almost to the end of the second column, but not wanting to hold things up too much, I stopped there. Right above the Wildcats ability. And this cost me dearly. For that one Warrior unit that had always lingered near her table edge now teleported to my edge and pillaged my building. All my mounted troops were just out of reach, even with the Iberia ability and the game was lost. This was really the low of the tournament for me. It had been the first game were my dice had rolled well and also the first, where I felt really at home playing the Spanish, so to lose like that really got me down. My opponent for the last game was Marco and this was the match-up (Jomsvikings vs. Spanish) that I always thought would be the most boring combination possible for this tournament. 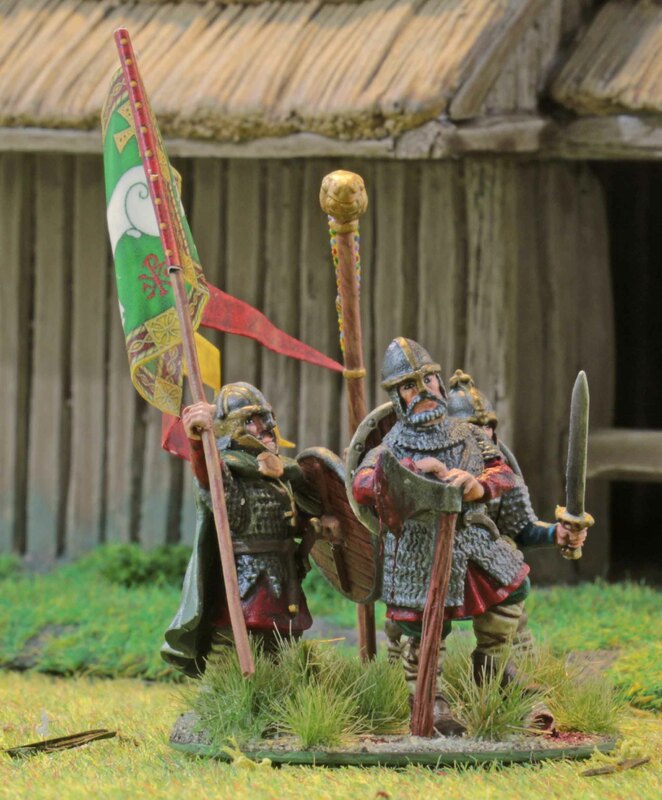 Marco fielded a regular Warlord, two points of Warriors and four points of Hearthguards. 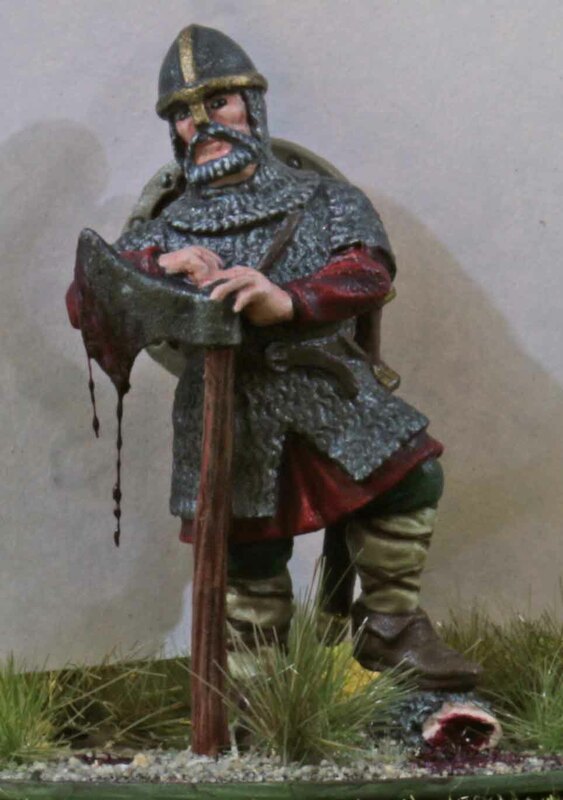 The later were fielded in units of five to six men with one six-men unit sporting Dane Axes. He played them in the very compact formation most Jomsviking players seem to prefer. The only really clash happened on the first or second turn, when one of his five-men units of Hearthguards attacked my 4-men unit. Due to the fact that they had to attack with a double move (and some unequal dice rolling) this ended with his unit being wiped out and me only loosing two riders. From now it became a slow war of attrition. With my Reconquista ability I pinned his Warriors half the game, essentially meaning that this Hearthguards had to move around them to attack. 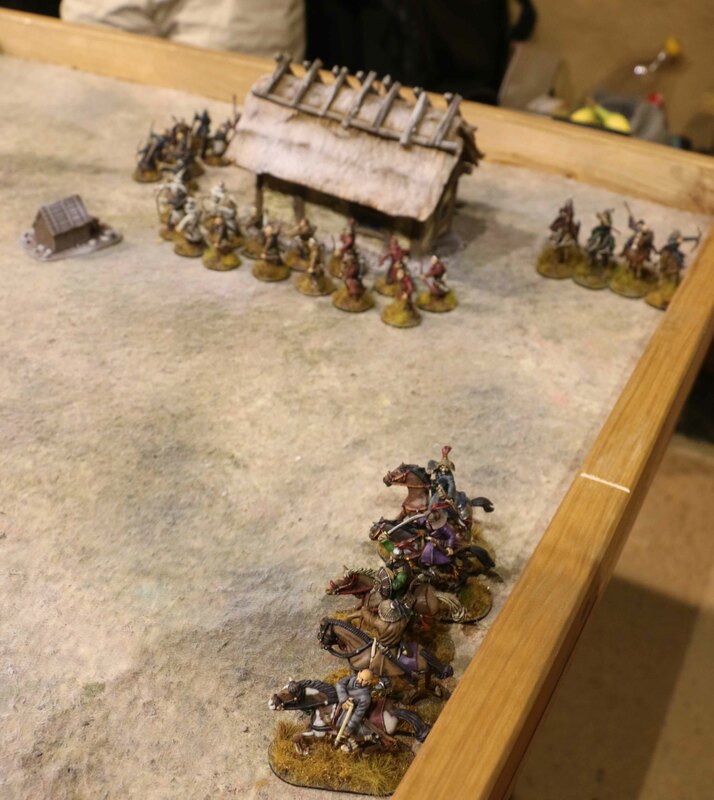 My horsemen always managed to get out of reach, while my mounted Warriors slowly took out his troops with their javelins. Together with the fact that I hardly ever granted him Wrath, this must have been one surely frustrating mach to play for him. 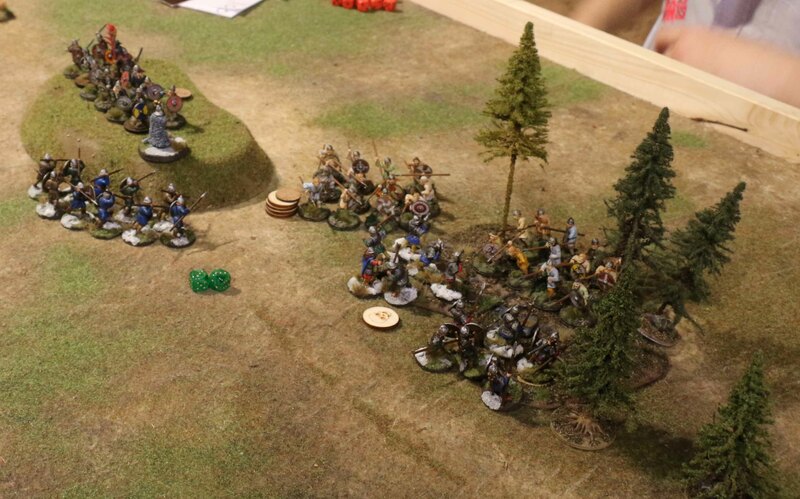 Due to his Warlord always staying close to the Dane Axes there was no chance for me to take him out with a swift move. And he did not fall for any bait I threw him either, so in the end this was decided on points. Not the most imaginative victory for me, but one I urgently needed. So how did it go in total. Well I missed my target position by a grand 19 places, finishing 24th out of 32 players. After really being unimpressed with my Spanish during the first few games, I really started to love them later on. I guess this goes to prove, that it is never a good idea to go to a tournament with an untested army. After the first day I felt a bit like it was all down to bad pairing, bad dice and maybe even a bad faction. 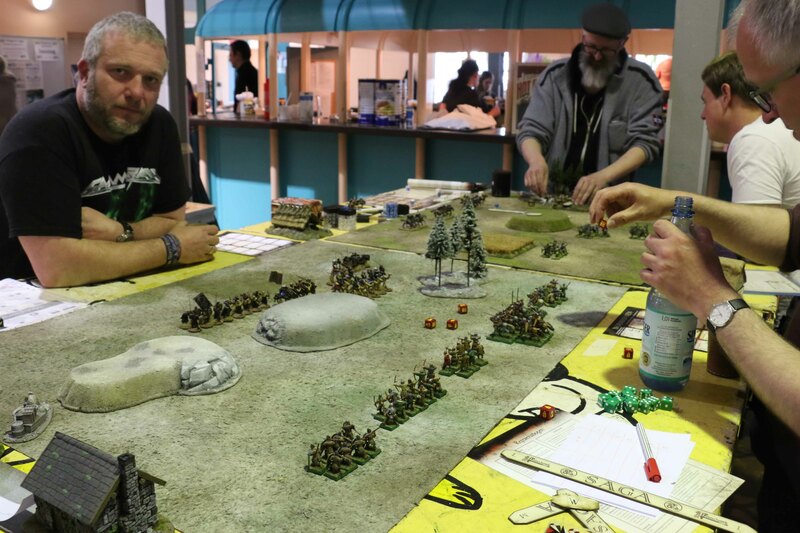 But to be fair and with a week to let it all sink in… those might have been factors, but I think the biggest factors me not know my army well enough, and making a few mistakes in the first game. I sure would have been unable to turn everything into a victory, but some games might have gone better. 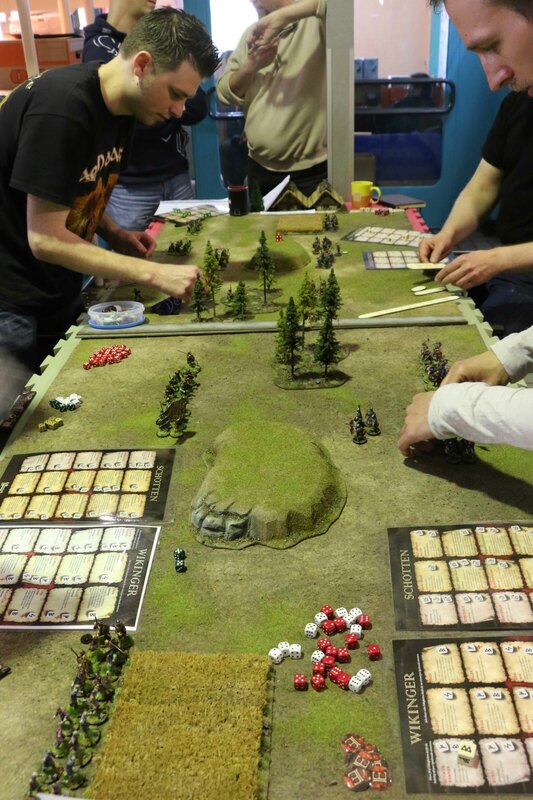 And I also need to make a habit of learning even the more obscure battleboards before a competition like this. When it comes to the Spanish. Had you asked me on Saturday, I would have dismissed them as a poor army. After Sunday that definitely changed and I already decided, that they will be the army I shall field next year. But I really need to learn to play them in a more offensive way. Regarding the event itself. It was just as great as it had been last year and as much fun. Definitely one to attend again next year. The one thing I noticed was, that many of the warbands (all over, not necessarily the people I played against) were more optimised than last year. More stuff that I would label power combinations. But do not get me wrong. 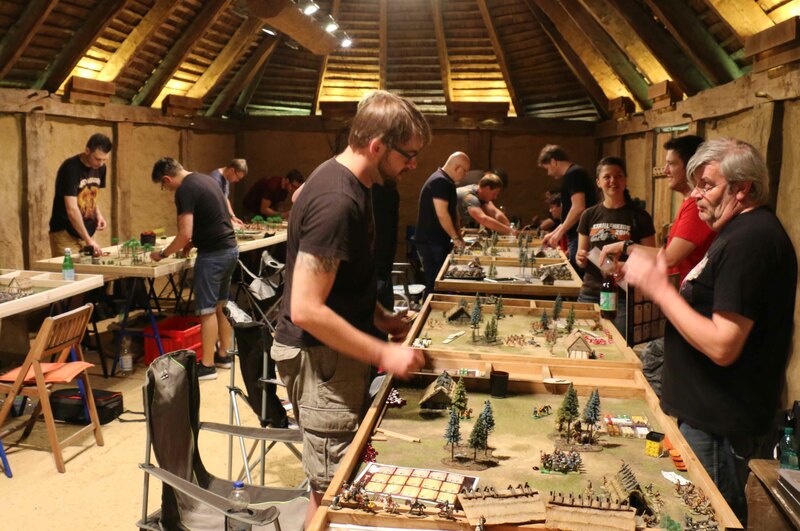 The general atmosphere was very relaxed and friendly and while I am growing ever more disenchanted by competitive play, this even sure is the exception due to the people playing in it. 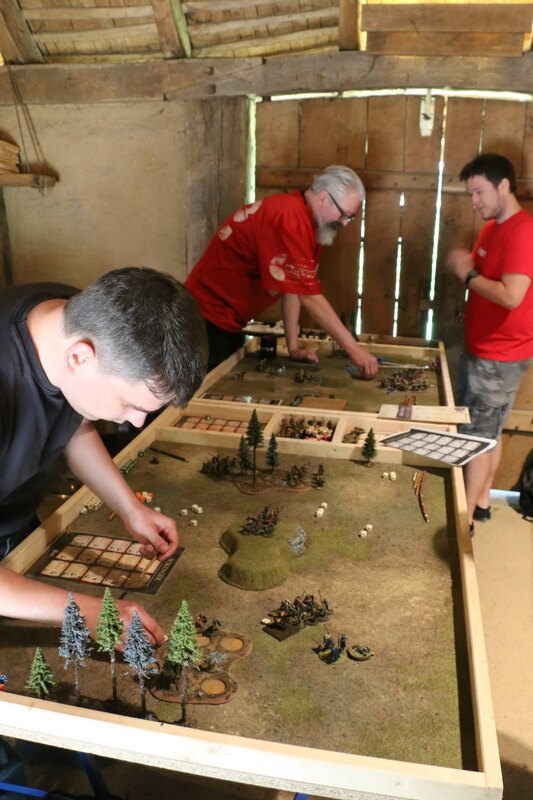 As those who have followed my blog over the past few weeks will know, I took part in a SAGA tournament the other weekend. 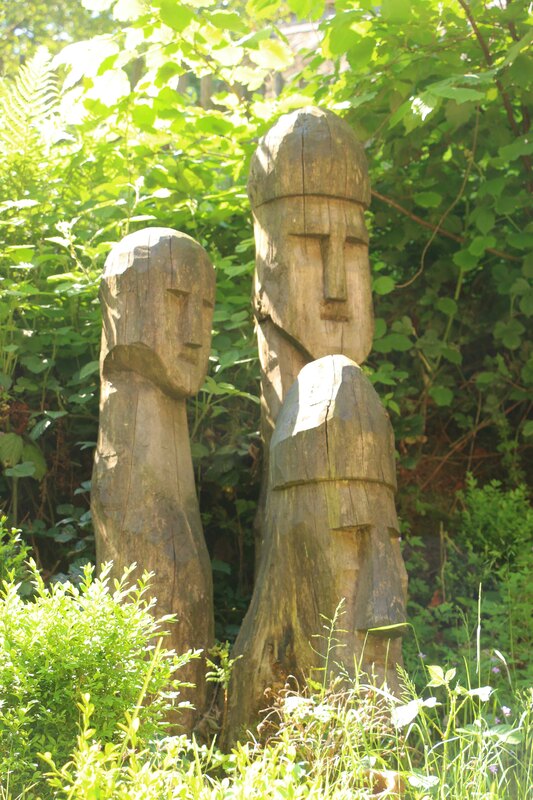 For those who will now ask “Did you finish your Anglo-Saxons?”… yes I did, but that will be my next post. What exactly did I play? My Anglo-Saxons were led by a Religious Advisor Warlord. 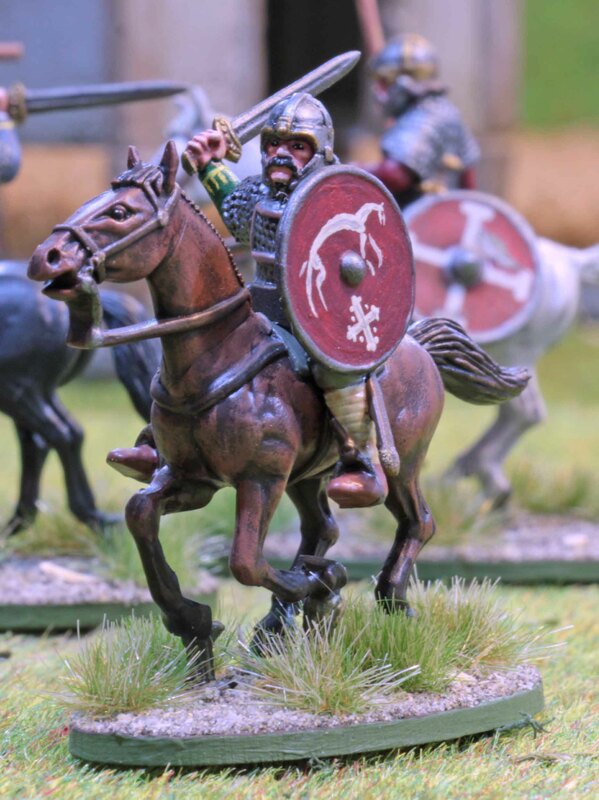 It featured two points of mounted Heathguards (amalgamated into one unit), three points of Warriors (amalgamated into two twelve-men strong units) and one point of Levies with shields and spears. So how did it go in general? Well, it was mixed. My opponents were great all around and a joy to play with, so no complaints on that front! My SAGA dice rolled really well, although I always got the multiple helmets on those turns when I did not need them and never when I really did. My D6 were abysmal though. Worst was the attack where I had 21 attack-dice with a target of 3 and only scored four hits (of which my opponent saved three). But.. c´pst la guerre, mon ami! In the first game I played a novice player with Jomsvikings in a “Clash of the Warlords” mission. Do not let yourself be fooled, novice or not, he knew his force and played it well, making the best of his abilities and keeping his Warlord well protected behind a strong screen of Warriors and Heathguards. The only reason why I was able to win this one was because I managed to lure his Warlord forward to attack one of my exposed units together with the Heathguards. Once he was in the main battle line, he fell to repeated charged by my Heathguards after an assault by my levies had reduced the number of retainers he could sacrifice to safe his life. The second game (where I forgot to take pictures) was “The cart” against a very experienced Moors player. He played a force loaded with Warriors and supplemented by Nephatim… one everyone seemed to loath at last years Grand Melee. Combined with my bad dice rolling his sound tactics really kept eating into my force, until there was hardly anything left. Desperate times calling for desperate measures I used what little was left of my force to block his cart, while I sent mine on a mad, unsupported Hail Marry move. Which paid off, since I managed to my cart of the table, to win the game. After this second game, I was second in the standings and was paired against the first and eventual tournament winner with his Welsh for a game of “Holy Ground”. The game was quite interesting in that I ignored the woods to the left for the game, while we battled it out for the hill in the middle. I held the woods to the right for the whole game while constantly being subjected to arrows and javelins from more than half his force. What really broke my neck there was the turn were my opponent rolled really well on his SAGA dice and was able to activate all his units at least once by regular means, plus another two times through the use of his two mass activation abilities. In the end it was quite tight with me loosing by two points. 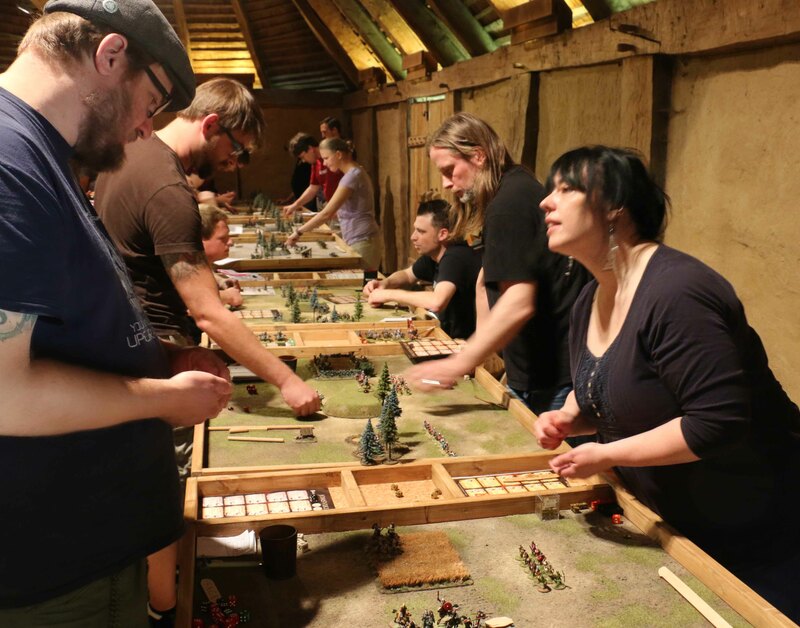 The last game was against Mutataw’wia in a scenario called “Pillage Village”. This is where my dice started going from bad to worse, with all my attacks and defenses going bad. Plus I was starting to feel the drain of a stressful week, a headache and four games in a row on this day. and was starting to make mistakes. Needless to say, this one ended in another loss. All in all I finished 12th out of 24, which was not bad, although I had entertained higher hopes after the first two matches. Thoughts on my force. Well most people criticised the use of two units of Heathguards in an Anglo-Saxon force. And I have to say… it was a mixed blessing. They proved critical during the first game and would have been of good use in two more games and I still think this has potential. But it holds true, that they were loosing effectiveness fast, since it was hard to keep them as the large unit to have them work for the Anglo-Saxons. The Religious Advisor Warlord was good, since he provided the resources (= SAGA dice) I badly needed and even though he lacked punch, he was really essential for the force as a whole. The Warriors and Levies worked fine though. BUT, I am sure I would ever use the Anglo-Saxons for a tournament again. You can really feel that they are lacking when compared to the newer Crecent & Cross factions that will often keep you from acting and making the best of your abilities. Well up next the preparations for this years Grand Melee will begin, which will mean painting my Spanish! 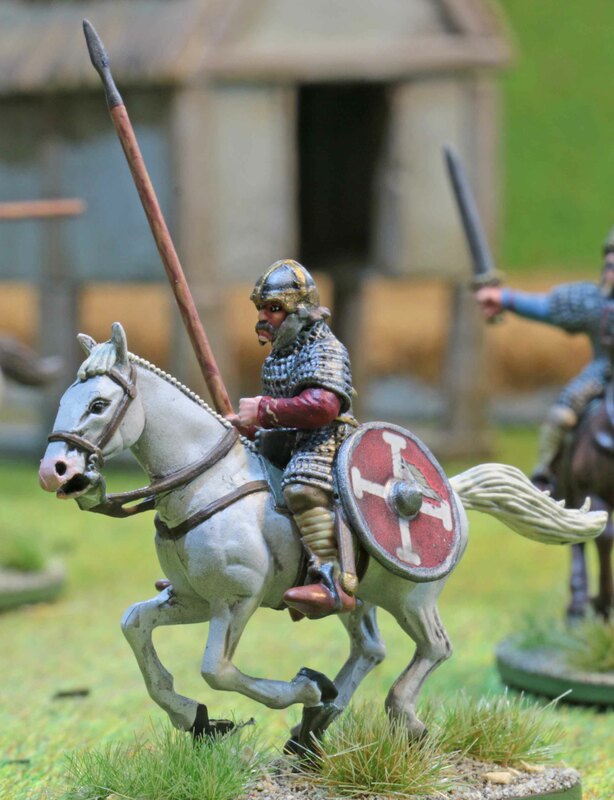 So this is last weekends output, some mounted Anglo-Saxon Heathguards for SAGA. 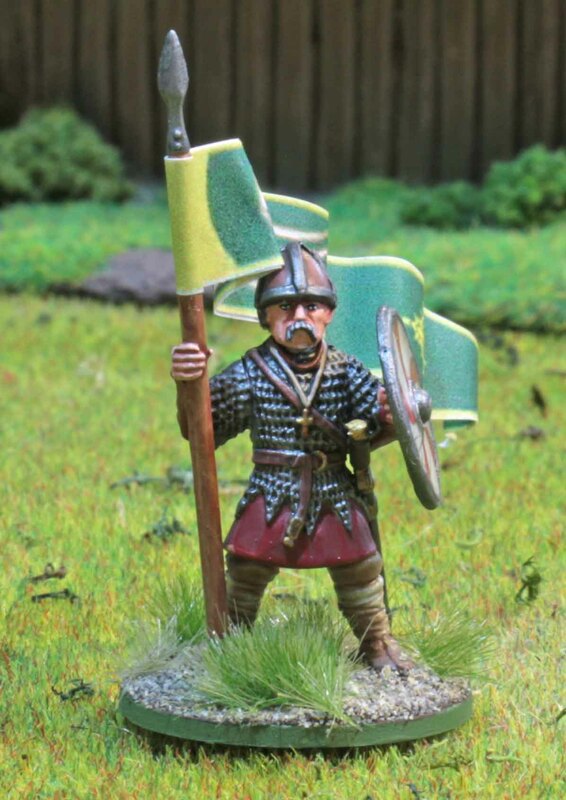 Now in general Heathguards seem to be a rare sight in an Anglo-Saxon war band in SAGA due to the fact, that Anglo-Saxons benefit most from large units (10+). 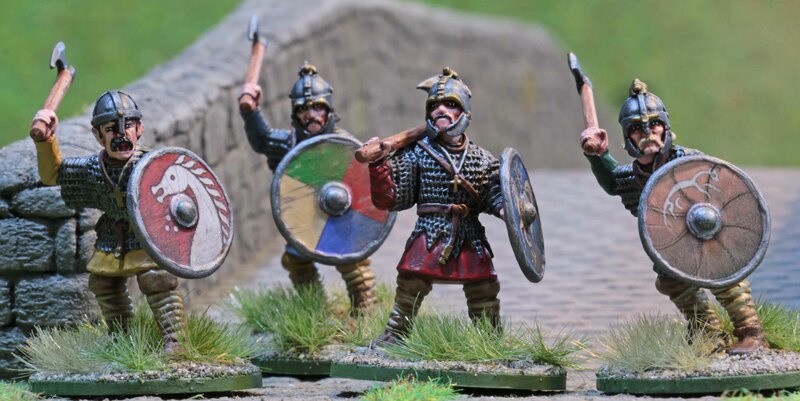 Given that you can only purchase 4 Heathguards for a SAGA point, the does not seem like a natural choice and to be frank… I am not sure if I am making a clever choice here. On the other hand, I feel that many scenarios do require the extra speed mounted troops provide, so I am willing to take that gamble. But maybe that gamble will pay off. If I amalgamate these two SAGA points into one unit it will be 8 men strong. With the right dice played on the right ability, this unit will count as 2-4 men stronger. But obviously that will leave me low on SAGA dice… ahh lets just see! Anyway, on to what is important for the Challenge… the minis. 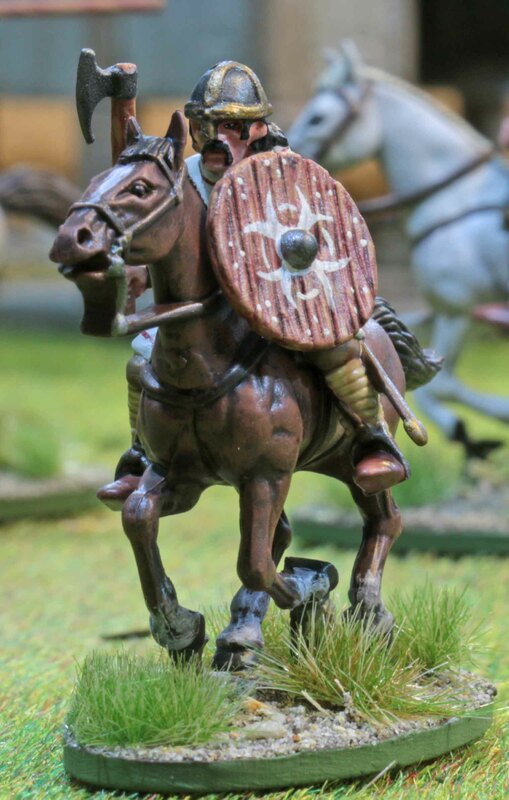 Mounted Anglo-Saxons are not the easiest models to find, so I decided to take another route here. 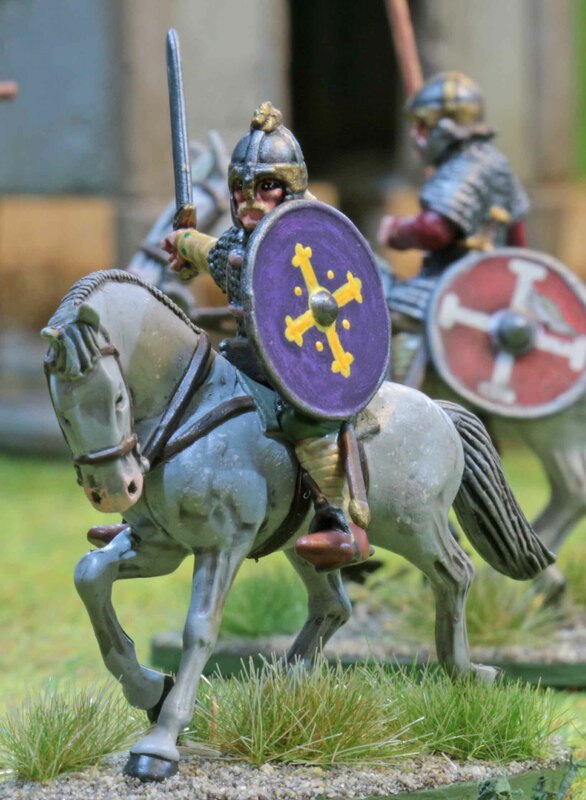 As some might know, I am simultaneously building a Norman army for SAGA and for those I had bought two boxes of plastic mounted Normans from Conquest Games. Actually more than I will need, so I decided to convert eight of them to Anglo-Saxons. 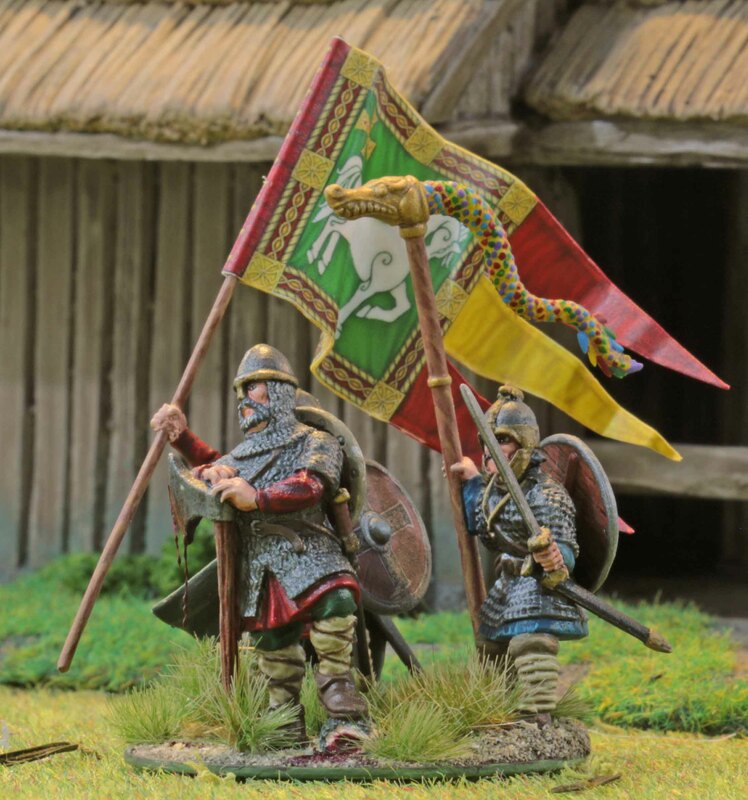 Now their equipment is a little different, since in SAGA the Anglo-Saxons are based on the late 9th to early 10th century, while the Normans are based on the middle 11th century. So I took the heads as well as sword / axe hands from the Gripping Beast Saxon Thegns box set and fitted those to the Conquest models. The hands were easy enough to do, but the heads required some work, due to the fact, that the Conquest models have the necks attached to the heads, while the Gripping Beast ones have the necks as part of the body. So that required some sculpting of chainmail around the necks. Which was half as bad, since the Conquest minis are all sculpted with their swords in their scabbards, so I had to remove the hilts and re-sculpt those sections anyway. Plus I love sculpting chainmail! Otherwise I went for the round shields that came with the Norman cavalry. 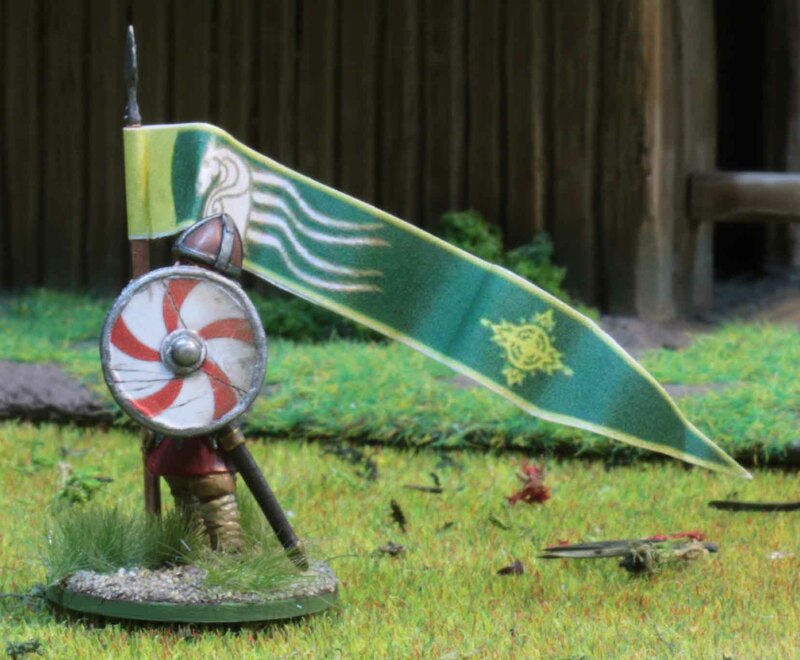 Tear shaped shields simply felt wrong for early Anglo-Saxons and that leaves me with tear shaped only shields on my Normans later on. So this was a win – win scenario for me there. Painting wise I went a slightly new route here. I have always felt, that horses were a huge time drain to paint. So some time last year I decided to do the at least the base coat with my airbrush and these were actually the first mounted troops I did since then. And I think this was a good decision. In the past it took me about 10 minutes to base coat a single horse, now it was 10 for the whole group (including cleaning the airbrush afterwards). So I think this will become my new weapon of choice for horses. All the rest was fairly standard straight forward painting. Not much to say there. Out of the eight shields, six are free-hand painted, with the two hanging by the horses sides sporting decals from LBMS. I really enjoyed painting these, especially trying to match their designs to those from LBMS, since all the other troops will have decals on their shields and I did not want them to stand out. But my favorite is the one below, due to the fact that it is a simple wooden shield with the design painted on the bare wood. That gave me a canvas to paint both the bare wood and a design, which was great fun. There is also something else that was a first for me with these minis. In the past I always used varnish from the can to seal my minis. As we all know, that creates a “no spraying time” when it is cold and/or humid outside. Something that kept me from a posting before last week and that is simply annoying. I have also been suffering from another problem for a little over a year now. I have always used an industrial varnish that produced a perfect flat result. But some time in 2014 they must have changed the formula, which always resulted in a satin finish. This would go flat after 6-12 month, but it was still highly annoying. So I got myself a 0.4mm needle for my airbrush which allows me to use varnish in it. 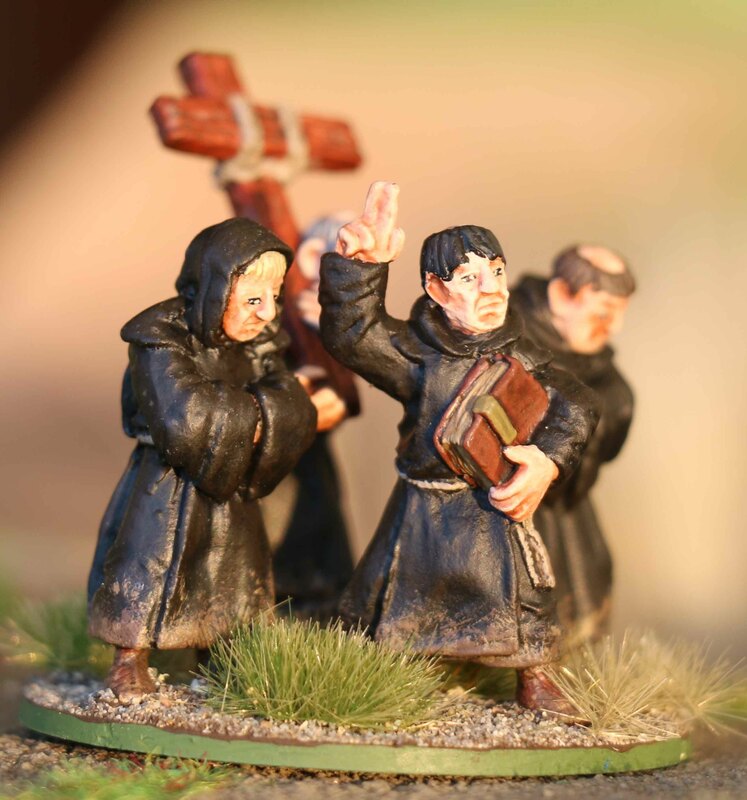 She these are actually the first troops to be varnished using an airbrush. Really happy with that, especially since it will allow me to varnish regardless of temperature and humidity. All in all, I am really really happy with these riders. 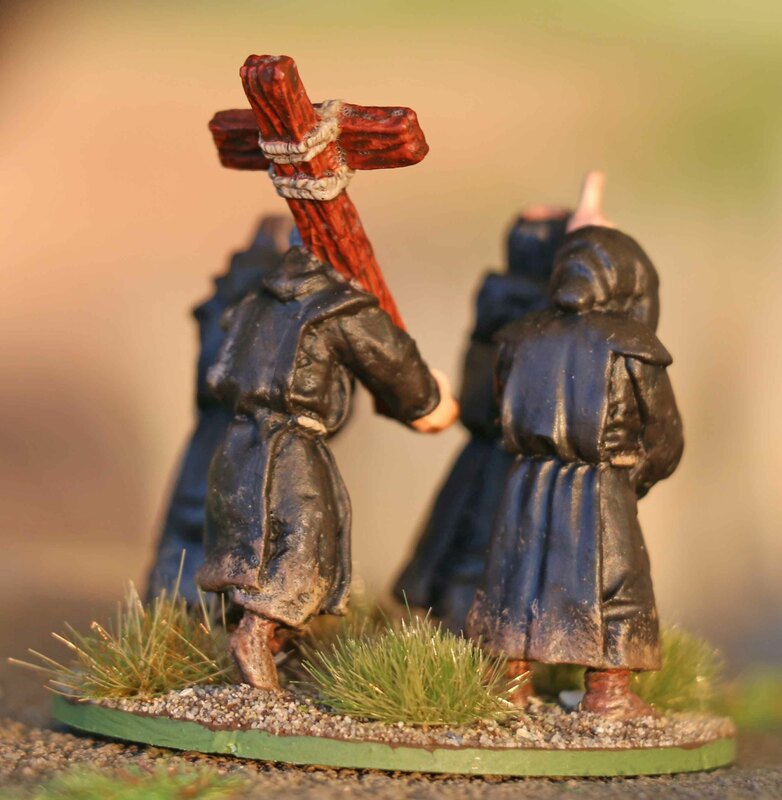 I feel plastic wargaming minis can be hit an miss. Some are marvelous, others can be awful. When I took these out of the box, I felt they were somewhere in between, but once assembled and painted, I can only say that they are lovely. Especially the horses, even though the animals require some filling where the body meets the neck. In that sense, I am really looking forward to painting the Normans later on! I also painted a bunch of Sci-Fi minis, but the bases bases on them are still giving me some troubles, so I am not sure, if I will be able to get those in before the Friday deadline for the AHPC (which I did not).